Would you like to discover new ways of expressing yourself? 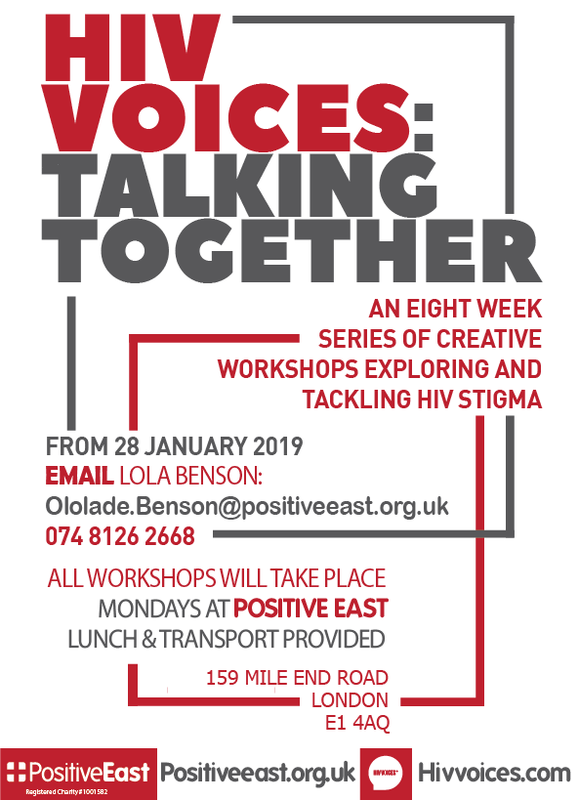 Positive East has paired up with HIV Voices to launch a new spoken word and performance project: HIV Voices: Talking Together. The 8-week series of workshops will focus on the theme of mixed HIV status relationships, and are for people who are currently in, or have experience of being in, mixed HIV status relationships. Throughout the process you will learn to harness the power of spoken word, unlock your inner poet (from the page to the stage! ), develop your confidence and have fun with a group of like-minded people. You will also have the opportunity to create and perform your own individual pieces of spoken word, a selection of which will be filmed using actors and screened and performed in festivals around London during the summer. No experience needed – just come with an open and curious mind. No pressure to perform either! For more information about HIV Voices Talking Progress and details about signing up, please email Lola.